The SportMaster ColorPlus Bulk System is the most convenient method of storing and dispensing color coatings. This tank system is comprised of two 3,000 gallon tanks, which allows for a total material delivery of 5,000 gallons of SportMaster Neutral Concentrate, or 4,000 gallons of SportMaster Neutral Concentrate with Sand. The Neutral Concentrate is delivered by a bulk tanker and pumped into the tanks through the top fill valves. Tanks in varying sizes for Acrylic Resurfacer or water are easily added to utilize the same pumping system. 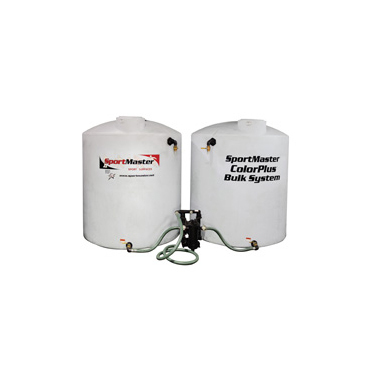 The SportMaster ColorPlus Bulk System is a bulk tank device specifically engineered for the material storage and dispersion of SportMaster Neutral Concentrate. The ColorPlus Bulk System has been designed for maximum efficiency of cost, handling, and drum disposal, making it the most productive and profitable method of mixing and handling SportMaster ColorPlus. Drums can be rinsed, reused, and filled to a level allowing for the addition of pigment, dilution, and sand- eliminating the time and mess of transferring from a full drum to an empty drum with a bucket. The most convenient method of storing and dispensing color coatings. Designed for material storage and dispensing of Neutral Concentrate (with or without sand). Minimize the usage and disposal costs of drums. Receive bulk shipments at a lower price per gallon (eliminate packaging costs).